The weights are copied from the other meshes bound to the same Skeleton. The weights are copied by projection. So the closer the target mesh shape matches to the source meshes shape, the better will be the weight copy results. Create Weight maps for the selected bones(1). Note: The setting here only controls the behavior of the Weight generator! 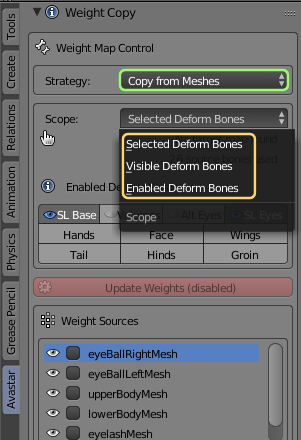 otherwise this setting is completely independent from what you have configured elsewhere in Blender (either in the Rig Config panel, or in the Bone properties window) . Important for Automatic from Bones): Please keep the Volume bones disabled when you use the Automatic from Bones strategy. Otherwise the generated weight maps will become totally wrong for this case. 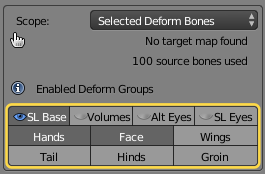 Important for Facemap Generator): Please enable the Face bone group when you use the Facemap Generator strategy. Otherwise the generated weight maps will become totally wrong for this case. Target maps are the weight maps the will be created. In this example we have chosen the scope Selected Deform Bones. However we have not selected any bone, hence No target map found. 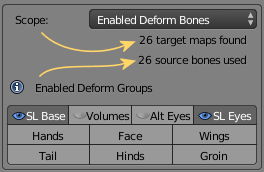 Fix: Enable at least one bone that is a member of one of the enabled deform groups. Here you see the number of bones that are contained in the selected deform Groups. Hint: When the scope is Enabled Deform Bones, then the number of target maps is identical to the number of Enabled Deform bones! In this example we have selected the legacy bones and the SL Eye bones, hence we get maps for 26 bones. All recognized Weight sources are listed in the Weight Sources widget. 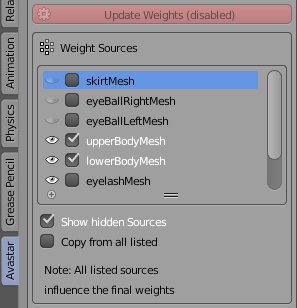 Here you can select exactly from which meshes you actually want to receive your weights. 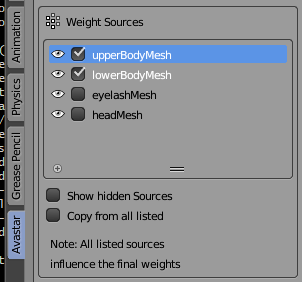 Important: Currently only meshes can be used as weight sources when they are bound to the same Avastar Rig. You must select at least one weight source mesh before you can do a weight source copy. List all bound meshes for this Armature. Hidden meshes will have their eye icon turned off. Tip: You can click the eye icon to toggle the Mesh visibility. 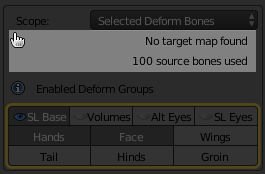 Makes sure that when you have selected bones only from one side of the rig, the bones on the opposite side are also included even when not selected. Note: Known glitch in Avastar-2.5: The number of target maps found currently does not count deselected mirrored bones, however the generator still creates the mirrored maps as expected. When enabled then the weight maps are cleared from all weights before the weight generator adds new weights to them. This is ideal when you want to renew entire weight maps. However sometimes you want to recreate the weights only for a subset of selected vertices (see next option). In that case you may want to keep the weights of the deselected vertices unchanged. In that case you will disable this option. Generate weights only for the selected vertices. This allows you to fine control for which exact parts of your meshes weights are generated or regenerated. Please take into account the previous option above.